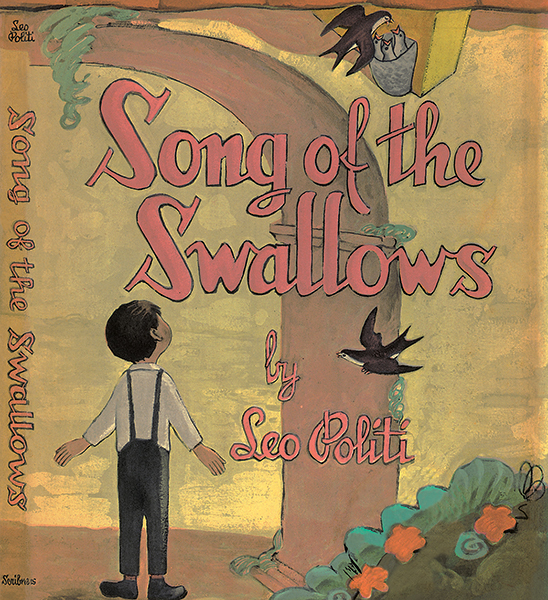 "Song of the Swallows", which won the Caldecott Medal when it was first published in 1948, was written and illustrated by Leo Politi. It tells the famous story of the yearly return of the swallows to the Mission San Juan Capistrano through the eyes of a small child, Julian, the bell ringer of the Mission, tells Juan, a young boy who also lives at the Mission, the story of the swallows and how - without anyone really knowing why or how - they return each year from their winter home in South America to San Juan Capistrano in California. Thrilled by the story, Juan makes his own small garden in the hope that at least one family of swallows will nest there when they return. This delightful book also includes the music and lyrics for "La Golondrina", a song about the swallows that Politi composed himself, and Spanish phrases are sprinkled throughout the story.